The origins of the DH98 Mosquito can be traced back to the England – Australia race of 1934 and the DH88 Comet racer. From that aircraft stemmed the DH91 Albatross, an elegant four-engined airliner of wooden construction. With war with Germany looking likely, the De Havilland Aircraft Company proposed to the Air Ministry a small twin-Merlin-engined bomber aircraft based on experience gained with the DH88 and the DH91. It would carry no defensive armament as its speed would allow it to outrun its opponents. 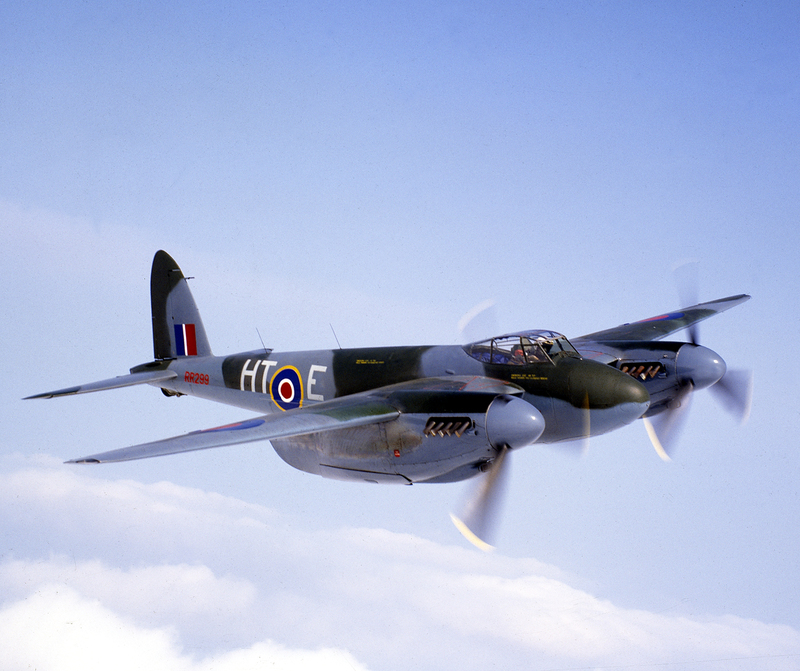 Thus was born The Mosquito – truly the original Multi-Rôle Combat Aircraft and a legend in RAF service. It was not until the Luftwaffe put the jet-powered Me262 into service that the Mosquito lost its speed advantage over other aircraft. Until then it flew almost unchallenged over the skies of occupied Europe but even then it could still evade interception as the endurance of the Me262 didn’t allow long for combat. This shot was taken during the summer of 1983 and I felt very privileged indeed to have this aircraft posing for my camera.